California has a long history of oil and gas exploration and production, but its story is far from over. The Sacramento Basin, in particular, is one region still holding many undeveloped large scale gas prospects. These prospects are ripe to be spudded and are supported by gas market economics. A huge jump in supply is needed to meet demand of the Californian gas market and fix the state’s current energy supply deficit, which sees it produce less than 10% of its gas needs. 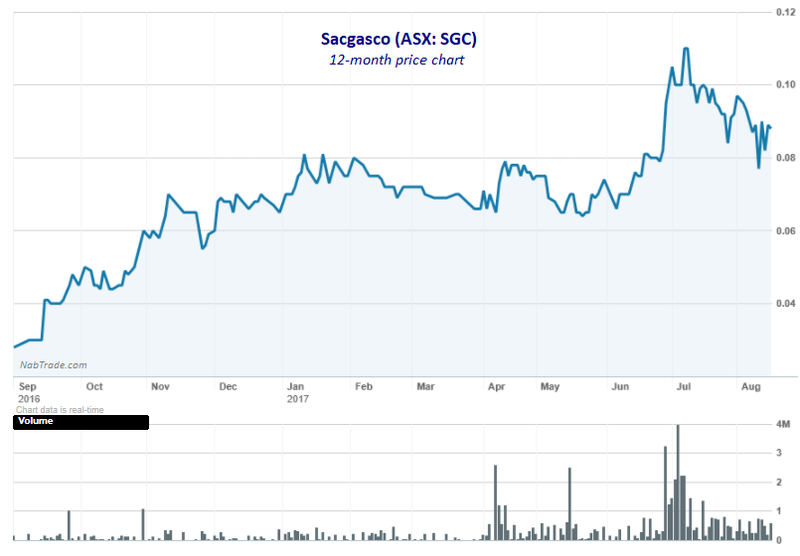 ‘Discovery Thinking’ has led Sacgasco Limited (ASX: SGC) to identify the huge overlooked potential in California’s world-class Sacramento Basin. SGC has identified multiple commercial opportunities just waiting to be unlocked and established a robust portfolio of modest to large-scale natural gas prospects in the Sacramento Basin. SGC believes the Sacramento Basin is underexplored, with many gas traps overlooked and that it holds multi-trillion cubic feet (Tcf) gas potential. Already, one of the state’s leading Natural Gas operators, SGC’s development strategy is to buy up existing producing and idle wells — those identified as having future potential — along with any associated infrastructure. These are viewed as facilitators for production expansion and market access points for gas discovered by exploration. The company’s key assets are the Dempsey and Alvares natural gas prospects, which have gross unrisked best estimate recoverable prospective resources of 1 Tcf and 2.4 Tcf, respectively. Its prospects are located close to under-filled gas trunklines that connect US and Canada gas supplies to the Californian gas market. In early August the company began drilling at its Dempsey 1-15 Natural Gas Well and by mid- August everything was proceeding to plan with mud logs from the well indicating that Dempsey 1-15 had intersected multiple intervals of interpreted significant gas shows in sandstones at the producing gas field levels. In its latest announcement, SGC has advised that it has completed field appraisal drilling, with wireline and mud logs confirming 4 zones of interpreted gas saturated sandstones between 1000 and 1560 metres. The net pay estimates range from 30-50 feet and the expectations here are that there is enough future gas production to cover well costs. Further news flow from the drilling will be available shortly as SGC turns its attention to drilling the more than five underlying targets. The well has been planned to allow these prospective zones to be successfully drilled and includes larger than normal drill hole sizes and high pressure well protection equipment. These underlying prospective reservoir levels are within a large 3D-seismic-mapped structural trap. Sacgasco’s interpretations of this area of the prolific (11-plus Tcf gas produced to date) Sacramento Gas Basin, show that only those wells drilled on valid structures have flowed gas to the surface from such reservoir levels. 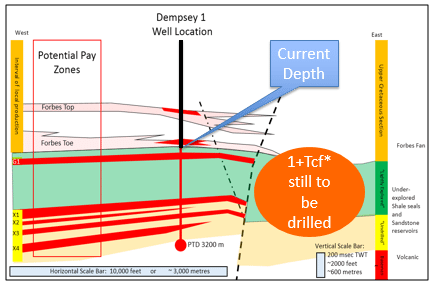 The Dempsey well will assess the quality of multiple levels of interpreted reservoirs on such a valid structural trap. Yet those considering this stock shouldn’t make assumptions regarding future results, nor should they base investment decisions on performances to date. On top of its two flagship Sacramento Basin assets, SGC has multiple follow-ups, on which it plans to make exploration progress with a target of over five Tcf of conventional natural gas. 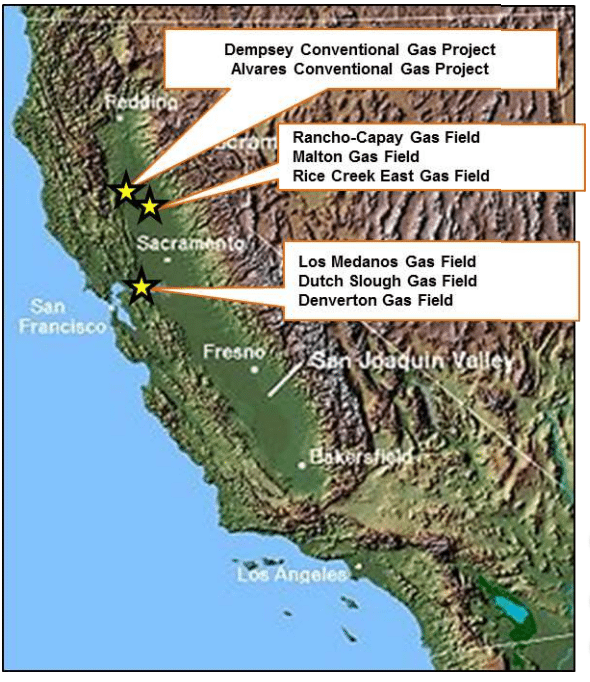 Having identified significant gas production opportunities in California’s Sacramento Basin, Sacgasco Ltd (ASX: SGC), is focused on natural gas exploration, development, and production in this region. SGC is targeting older, proved petroleum systems interpreted to be in the 100 Bcf to multi-Tcf recoverable gas range. The development strategy is based on acquisition of producing and idle wells that still have future production potential and their associated infrastructure which gives Sacgasco ready access to premium markets. The company currently has two natural gas projects on the go, Dempsey, which is the primary focus, along with Alvares. When we first introduced you to SGC on July 5, 2017, we explained that it was preparing to spud its first well at its Sacramento Basin project in California. The company was eyeing off around 1 trillion cubic feet (Tcf) of recoverable gas. The following day, the company announced that it had been granted a drill permit for its Dempsey Well. The $18.1 million-capped Perth-based company then commenced drilling at its Dempsey project on August 2. Since then updates have been made available in regards to progress of Dempsey 1-15 Gas Well drilling. On August 14 SGC confirmed that its drilling was proceeding to plan and just yesterday it announced that field appraisal drilling at Dempsey 1-15 had been successfully completed and had reached the planned intermediate casing point. It has also been wireline logged, with wireline and mud logs confirming 4 zones of interpreted gas saturated sandstones at field production levels (depths at approximately 1000 metres to 1560 metres. The good news for SGC is that based on log correlations and 3D seismic, these gas filled sands are yet to be produced in this fault block of the field. The net gas pay estimate from the logs range from 30 to 50 feet depending on petro-physical cut off values. The zones will now be protected behind casing as SGC gears up for future testing and production. Interestingly, the California Regulator website shows SGC’s offset production wells have produced natural gas volumes in excess of 1 Bcf of pipeline quality natural gas from individual equivalent zones. That fact alone should give SGC confidence moving forward as it now prepares to drill the more than five remaining prospective underlying sandstone targets. This is only the first phase of drilling for SGC, but already results are consistent with the company’s pre-drilling prognosis. With these positive results in mind, let’s take an in-depth look at Dempsey. SGC has a 50% working interest in the Dempsey Gas Project and an agreement with Empyrean Energy PLC (LON: EME) to farm-out the 30% working interest in return for US$2.1 million funding. Additionally, Pancontinental Oil and Gas NL (ASX: PCL) and Xstate Resources Limited (ASX: XST) each have a 10% interest in the Dempsey Project. Pancontinental is paying 20% of the costs to earn 10% working interest. Consequently Sacgasco is paying around 15% to retain 50% working Interest. So far, drilling at Dempsey 1-15 Well has intersected 4 zones of interpreted producible gas in sandstones at the producing gas field levels, according to logs from the well. The well still has to drill through over five stacked conventional reservoir targets. Should all the remaining stacked reservoirs be full of gas, the cumulative unrisked recoverable Prospective Resources within the prospect could exceed 1 Tcf. The drilling that is now underway should help determine whether there is in fact a significant quantity of movable hydrocarbons. Quantification of these positive indicators will be determined from conventional petrophysical logs which are planned to be run at the conclusion of drilling the current 8 1⁄2” hole section within the coming weeks. The well is now preparing to drill ahead at a depth of approximately 1760 metres. 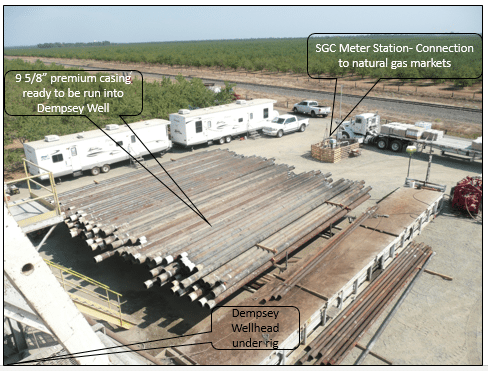 The proximity of the connection to California’s gas pipeline system will facilitate early cash flow from any success at Dempsey. It also means that the commerciality threshold at Dempsey is very low. 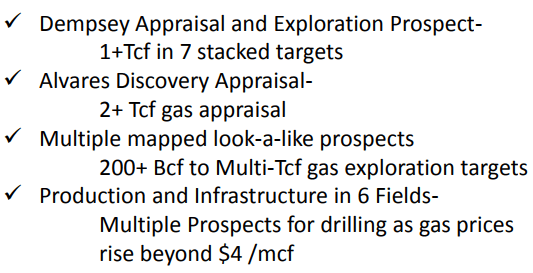 In what could prove to be share price catalyst, leases have been acquired over three Dempsey trend prospects for follow up once success is confirmed at Dempsey 1-15 well. Speaking of the share price, it’s worth noting that SGC’s intent focus on the Sacramento Basin has seen its share price rise by 193% over the past 12 months. While it’s pulled back a little in the past month, the longer term trend is higher, supported by rising volumes. One undeniable catalyst coming in late-June was the signing of the farm out agreement with Empyrean Energy, followed by the announcement that the Dempsey Well was on track for spud. Yet this rally could be dwarfed if SGC come across a major gas reserve at either Dempsey or Alvares. There is still much work to do before this happen, so investors should take into account all publically available information and take a cautious approach to their investment decision. If the company continues with market pleasing announcements, there’s good chance that investors will continue to be rewarded. And of course there is the fact that its operations and exploratory work is backed by a favourable fundamental economic backdrop. The second of SGC’s flagship projects is the Alvares Project, which SGC is following up on a 1982 discovery of gas and large column of high gas shows. It was ultimately bypassed as the focus at the time was on drilling for oil. Note that while this project isn’t gaining the attention of Dempsey currently, it could potentially have double the volume of Dempsey, being a 2.4-plus Tcf project. One important factor is that SGC has targeted prospects with the best chance of commercial viability. That is, gas that is under and adjacent to already discovered gas sources. Its strategy was supported by an extensive database of both 2D and 3D seismic and wells that was readily available. Not only does this increase the chance of a successful and large discovery, but also keeps costs down when accessible gas infrastructure is nearby. 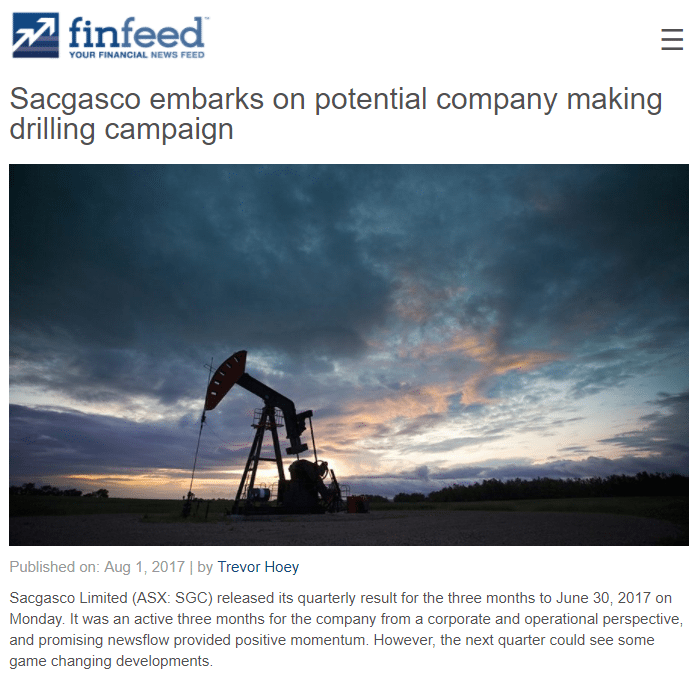 Sacgasco also has activities underway to increase the operated natural gas production by up to 1.5 million cubic feet per day, for a 200% rise. SGC’s development strategy in the Sacramento Basin represents an opportunity to increase near-term supply to a California gas market with a significant energy supply deficit. California’s gas demand is approximately seven billion cubic feet per day, with local California gas production only contributing less than 10%. Natural gas is an increasingly important source of energy for California since its power plants rely on this fuel. The state continues to depend upon out-of-state imports for nearly 90% of its natural gas supply, and as you can guess, this leaves a huge opportunity for local natural gas producer to step in. By 2025 it is expected that California will import 98% of its natural gas requirements. Despite having significant untapped natural gas reserves, California is a net importer of natural gas. Clearly there is demand for natural gas from within California, but SGC is also aware of opportunity to export to other US states, especially those that are not gas producing. That’s not ever considering the potential to export abroad. One development of particular interest is a massive natural gas trade deal signed earlier this year between the US and China. 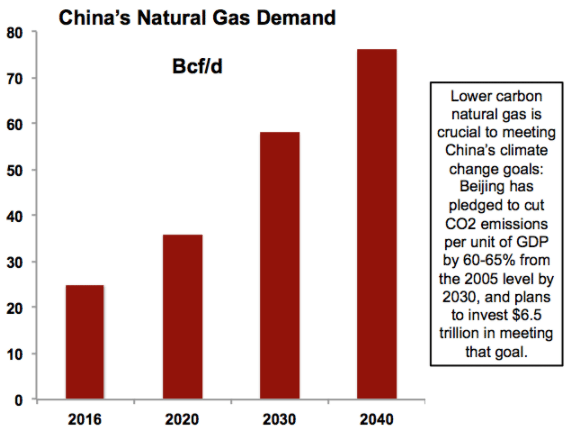 In May this year China and the US signed off on a massive liquefied natural gas trade deal. This will allow the US to export their LNG to China. The deal could pave the way for a second wave of investment in US gas terminals, connecting the fastest-growing supplier, the US, with the biggest growth market, China. The US is already on track to emerge as a net gas exporter by next year. With the growth and urbanisation of the Chinese population, the country is needing to find new sources of energy. On that basis, there are estimates that the deal could bring in tens of billions of dollars to the US each year. 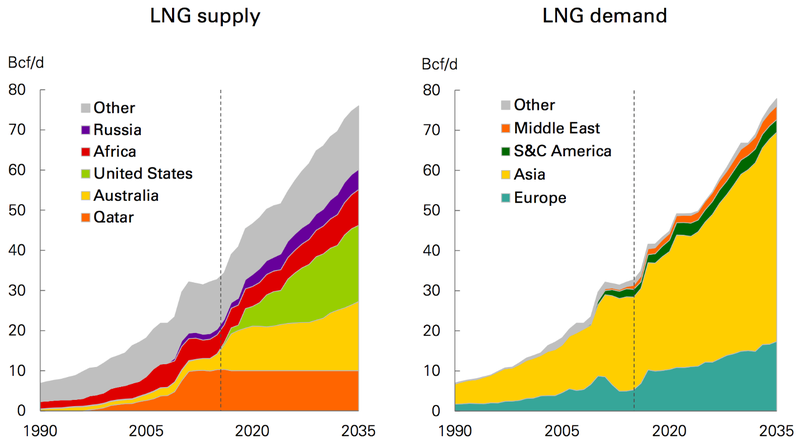 The following chart from Natural Gas World Magazine highlights not just the growing demand from Asia through 2035, but also the projected growth in supply from the US, much of which will come from California. All this comes in spite of the growing coverage around the rise in renewable energy sources and the environmental impacts of hydrocarbons. While oil is bearing the brunt of the negative press, natural gas is a ‘cleaner’ fuel that produces less carbon dioxide so it isn’t as environmentally damaging...and clearly still has plenty of demand growth ahead of it. The US oil and gas industry also has the support of US President Trump, who has expressed his vision for an ‘American First Energy Plan,’ which would see the US become ‘energy independent’ and to emerge as a net energy exporter. You can review the plan from the White House here . Of particular interest to natural gas producers, as well as aspiring producers and their investors, President Trump also wants to focus attention on promoting natural gas over coal in order to tackle emissions. SGC has already impressed investors this year, and with continued drilling at Dempsey, four gas zones already confirmed (so that the well cost at Dempsey is effectively paid for from expected future production from these zones) and its expansive portfolio of Sacramento Basin natural gas assets, the company is well positioned to establish itself as a major gas supplier. SGC is uniquely positioned to unlock the Sacramento Basin’s gas potential. It holds a high working interest in its projects, has a tight share register, low cost onshore operations and has easy access to a world-class growing gas market. It’s certainly one that small cap investors should keep an eye on. Is an ASX Junior Sitting on a Multi-Trillion Natural Gas Resource?